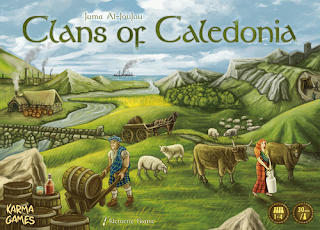 Clans of Caledonia is a strategic and interactive economic game for 1 to 4 players that is set in 19th-century Scotland. Featuring a modular map, nine historic clans, and various scoring and port tiles Clans of Caledonia provides plenty of replayability. 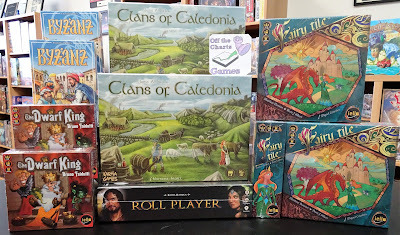 The core mechanics and strategies are very thematic. 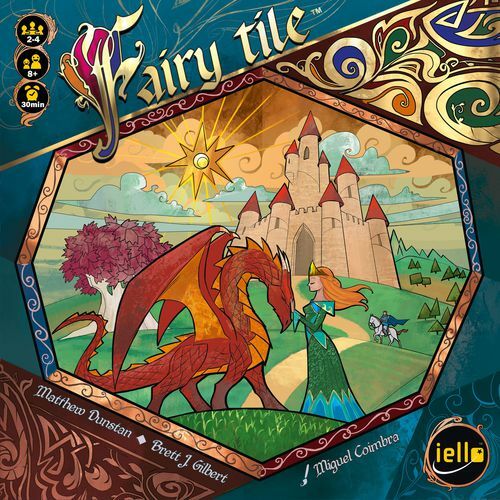 Fairy Tile is a strategic and adventurous tile-laying game for 2 to 4 players. Develop the kingdom of Fairy Tile by putting new land tiles in play and moving the princess, knight, and dragon across different places such as mountains, forests, and plains. Help them have extraordinary adventures by accomplishing objectives written on the pages of your book. As soon as you complete an objective, develop your story and read the page of your book aloud. Be the first to read all the pages of your book to win the game. 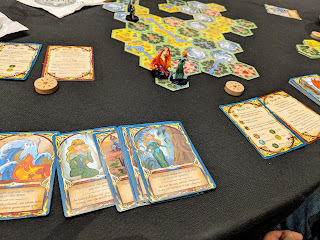 What's also cool about this game are the princess, knight, and dragon figurines and the fact that you have a story that reads complete no matter the order in which you complete your cards. 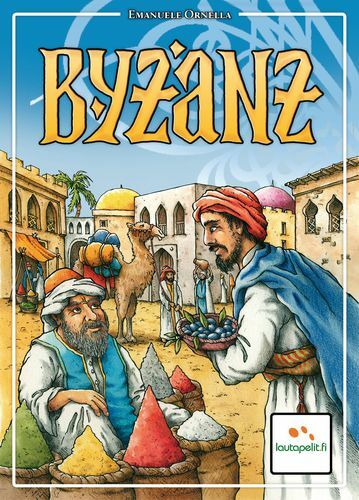 From Renegade Games is Byzanz, a card game for 3 to 6 players. In the bustling market of Byzanz, bundles of goods are available to savvy merchants. Bid for the best bundles, catch a deal at the main market, and find the right moment to sell the goods you have collected. 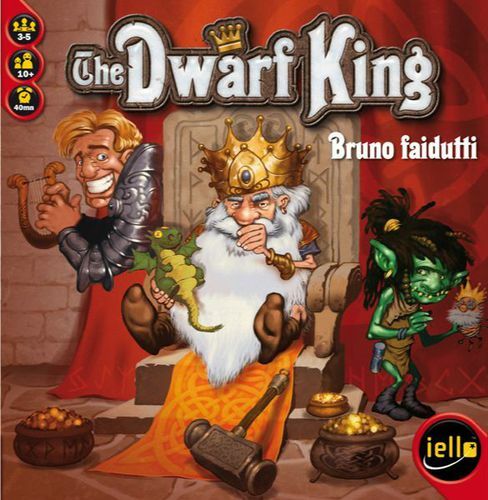 Dwarf King is a trick taking card game full of surprises made up of suits of various goblins, dwarves, dragons, and magic. A game is made up of decks of basic cards, special cards, and quest cards. Played over seven rounds, each round begins with a random draw of a special card, revealing it's effect and shuffling it in with the basic cards and dealing a hand to each player. Then a random quest card is drawn and one of the two scoring rules written on it is chosen. Each player then makes the best of it with the hand he has been dealt. The goal is to take tricks or to avoid taking tricks depending on the chosen scoring rules. 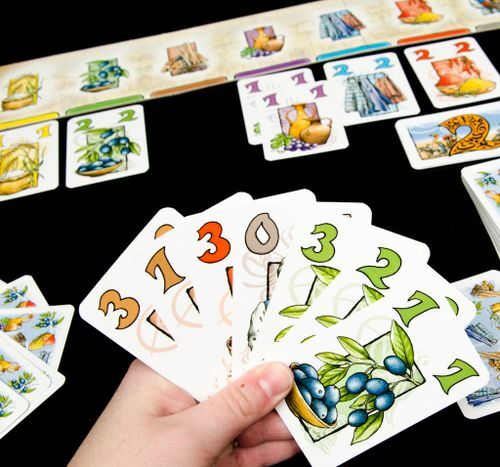 The player with the highest total score after seven hands wins the game. A different scoring rule is chosen for each round. 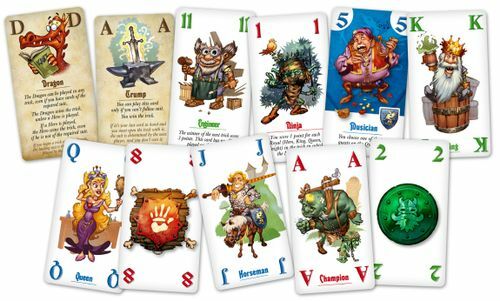 The type of card you have in your hand at the end of a round will determine if you will be the start player, special card drawer, or the one who will reveal and chose the next quest scoring rule for the new round.